Pictured left is a bucket truck. 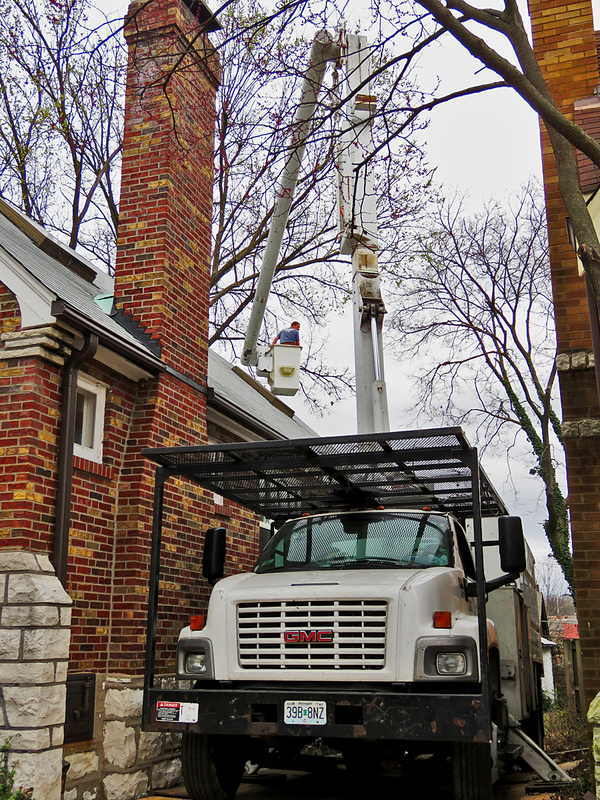 It belongs to the tree service that I hired. How it came to be in my driveway yesterday is a long sad story. It began a few weeks ago, when I met with the service’s salesman. We have an elm tree, which you can see in the background that I thought needed to be trimmed, because it was hanging over the roof. The salesman, I could tell did not share my concern, but for his trouble and because he had a live one, he offered to cut off one branch for $300. Time passed and the day before we left for NYC the salesman called to tell me that the crew would be out the next day. We were in NYC when the salesman called again to tell me that the branch had fallen, hit the roof and knocked a hole in it. The crew had covered the hole with a tarp, because that night there was one heck of a storm. When we returned, there was no tarp, but there was a board nailed over the hole. I was deciding on whether to complain about this ‘fix’ when the pictured truck showed up. They fixed the hole and replaced the shingles, so in the end everything turned out fine. Now for some unambiguous good news. Last week I reported that David had been accepted at Harvard for a post-doctoral stint that is to begin later this year. Today, Dave reported that he had also been accepted at Katholieke Universiteit Leuven (Catholic University of Leuven), Belgium. Leuven is a smaller town near Brussels. Interestingly, a third school in Germany, his so-called safety school ended up filling that position, before he could get his application to them. He plans on visiting both Boston and Leuven, before he makes a decision. Also today, Daniel reported that he had been published. 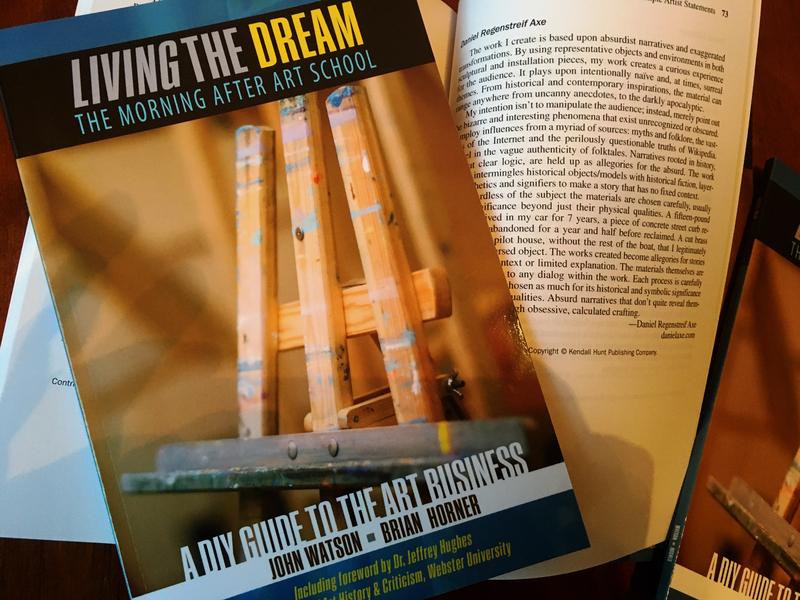 Pictured below is the cover of Living the Dream – The Morning After Art School and Dan’s one page write-up. Author John Watson was Dan’s sculpture professor at Webster. This journal is part of a series that includes other issues covering music and drama. Dan is expecting delivery of a complementary copy of this journal soon. This entry was posted in Art, Family, Life, Photo, Photography, Saint Louis, Science by RegenAxe. Bookmark the permalink. Leuven is so beautiful and the university is famous in Belgium and so very charming. Sounds like Dave will have a tough decision to make. Yes, both Dave and Dan are our sons. I see 🙂 Both of them make you proud clearly.